Plaster cast, very finely modelled, coated with protective lacquer, on verso incorporated wire for hanging. In custom-made wood shrine with openable doors and velvet lining. From the estate of a former fellow officer of Rommel, who served with the Desert Fox in WW I and commissioned the manufacture of the death mask after his brother-in-arms had died. 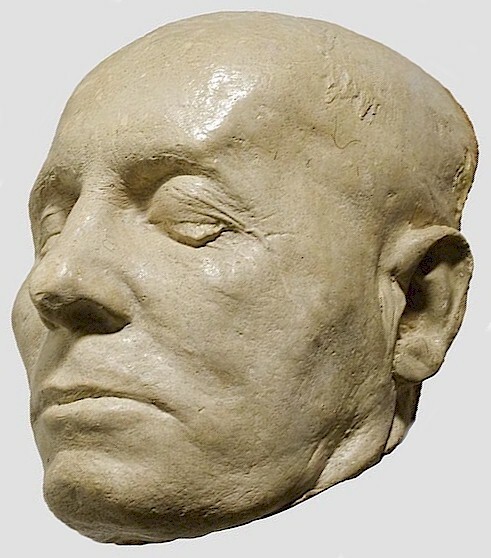 Three plaster masks were made in total, one remained with the Rommel family (today in the tank museum in Munster) and one went to a high-ranking German army official. In the extensive folder that comes with the death mask among other documents two typewritten letters by Rommel dated 1943, addressed to his former comrade (heading Rommel Generalfeldmarschall) and signed in pencil E. Rommel, one with envelope, verso stamped Generalfeldmarschall Rommel 39496 (the number is scratched out and replaced with 00220). Copies of a short military biography, entrance card for the (transl.) act of state on the occasion of the state funeral, various letters to his comrades (to Kimmich, bearer of the Knight's Cross with original signature/Hitler's order of the day after Rommel's death, quoted in a letter by Major Schumm) as well as letters by Lucie Maria Rommel from 1942 - 1945. Copy of a report on Rommel's injury caused by enemy aircraft in July 1944, copies of Manfred Rommel's sworn declaration on the death of his father from 27th April 1945, and many more documents.